At 20, pianist Daniil Trifonov is winning global recognition for the fanatic fervor he expresses toward his music. The day before his Carnegie Hall debut in October, I found Trifonov backstage, nibbling on a small bag of nuts. “I don’t always have time to eat, but I make time to practice,” he said, referring to his impromptu lunch. Pale and slight of build, the 20-year-old still looks like an adolescent, but he is becoming known as a comet of fierce musical talent, an unassuming young man who approaches his music with a focus nearing fanaticism. As we talk, I realize that he has hardly been touched by his sudden stardom and that all he cares about, still, is the music. The rest – the jet-setting life, the many concert halls and the fawning admirers--don’t seem to really exist. Withdrawn and serious, he has a studied indifference to the hype around him rather than the casual nonchalance of more seasoned artists. He speaks hesitantly and tersely, searching for words and ending many of his sentences questioningly, as if unsure if he had found the right words to convey his meaning. Trifonov has had a whirlwind year since he won third prize at the XVI International Chopin Piano Competition in Warsaw last autumn. Prizewinners’ concerts took him around the globe, then in May he won the Arthur Rubinstein International Piano Master Competition in Tel-Aviv, which sparked off a dizzying two weeks of concerts. In mid June, the day after those concerts ended, he arrived in Moscow for the International Tchaikovsky Competition. And he did, to the delight of many. Over the past two decades, the competition had lost its prestige, earned a corrupt reputation and turned out winners the public was not satisfied with. Its reputation had fallen so low that the Russian culture ministry intervened in 2010, appointing conductor Valery Gergiev chairman and tasking him with reviving the competition’s old glory. Deep-rooted distrust is hard to overcome. Here, however, was a winner everyone could love. It was like the good old days when stars were born from the competition. Trifonov's world tour includes Italy, Switzerland, France, Austria and Germany. Outside of Europe, he will perform in Azerbaiijan, Turkey, Israel, Brazil and the U.S. In New York and Washington, DC there are no concerts announced yet for the first half of 2012, although there are several concerts in Chicago, Texas, California and Maryland. For more information about Trifonov's schedule click here. “Great artists such as Van Cliburn and Grigory Sokolov won this competition. As a Russian, it has a great significance for me – it was one of my dreams,” Trifonov said. 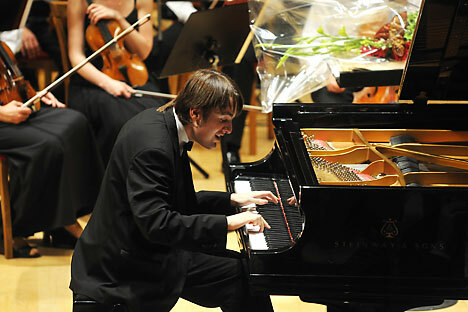 After his win, Trifonov was swamped with concert offers. He received 150 for the following 12 months, and whittled it down to about 85. “At my age, 150 would be suicidal,” he said. Though time is scarce, he usually sets aside five to seven hours a day for practicing. Born in Nizhny Novgorod, Trifonov moved to Moscow when he was nine to study with Tatiana Zelikman (whose other famous pupils include Konstantin Lifschitz) at the Gnessin Special School of Music. He stayed with her until he was 18 then came to the United States with a scholarship from the Guzik foundation. Zelikman recommended him to Babayan, with whom he still studies in between concerts, whenever he can – sometimes for hours day after day. That he does so is apparent from the way he plays, as if nothing else exists in the world. His concentration and focus are remarkable. As Irish pianist Barry Douglas noted, Trifonov “plays with a passion and sincerity that touches the audience.” He is completely absorbed by the music he plays, and his belief and trust in his mentors - Zelikman in Moscow and Babayan in the United States – are unshakeable. The latter’s influence is apparent in his playing; some of Trifonov’s most engaging characteristics, such as the unusual elasticity of his intonations and his attention to finer details, are from his mentor. Music critic of The New York Times Anthony Tommasini pointed out that Trifonov still needs “artistic mentoring and guidance.” The audience may love him for his “boyish appeal and phenomenal virtuosity,” but he cannot capitalize on that forever. The novelty of youth wears off quickly, and audiences may turn their fickle attention to the next new young talent – if the grueling touring schedule doesn’t make him burn out first. At his Carnegie Hall debut last month, Trifonov performed the Tchaikovsky Piano Concerto No.1 with Valery Gergiev and the Mariinsky Theater Orchestra. His Tchaikovsky was not typical hearty Russian music; it strove to be something more refined and striking. While his delicacy made for some exquisite moments in the second movement, it didn’t always work out well, especially in the first and last movements where he seemed to lose sight of the bigger picture. He contorted each phrase into something exceptionally delicate, but with so much focus on details, the sonorous richness of the music was lost, making it a little brittle. Nonetheless, he roused the audience to a frenzy of admiration. There is no doubt that he is a young man of prodigal capability. Yet, he is unlike any of the other extremely talented pianists we see cropping up by the dozens. What in him sweeps listeners off their feet? Indeed, in a world where so many artists vie for our interest, push their interpretations at us and try to impress us with their prowess and charisma, Trifonov disarms us with his more modest approach. He does not use music as a canvas for his own personality; he plays to embody music. His playing has no ego in it. He is transparent; untainted by the need to give a part of himself to the audience. He just wants you to hear the music. He is a vessel for the music he plays, and as such, an ideal one.